On the left hand side of each screen is the Filter Tool; this is used to control the data that is being displayed in the charts.The date range is used to control the dates that are displayed in all the charts on the dashboard. This also effects the top ten and summary charts. Everything that is being displayed in the dashboard is controlled by this date range.It is also possible to select a user start date; this can be a single day or a range of dates and will select users that only started within this range of dates. This allows the user to select a cohort of new players and look at the metrics for just those players.The age filter allows the data to be filtered to only users of a certain age and gender allowing the data to be viewed for just male or female users – if this data is collected.The select location filter is used to filter the charts based on the location of the player; acquisition channel can be selected, allowing data to be filtered by acquisition.The Displayed annotations allow Meta data about the game to be displayed on top of the charts (see annotations tool).Each of these filters can be used in combination, allowing a detailed analysis of player groups. The date range selector allows the user to select either a range of dates or a single date and has a number of pre-defined ranges to make selection as easy as possible. The start date is an extremely powerful filter. This filter allows the user to select either a single day or a range of days and look at players with a start date in this range. This makes it possible to look at only new players that have started on a specific day and see how they behave over a period. Taking a change to the game and looking at new players that experienced this new version it is possible to see differences in behaviour, spending patterns and retention rates compared to a set of new players that only experienced the previous version. This ability to cohort the players based on the date that they started and then look at those players across the full dashboard provides a huge level of power to understand how players are behaving in the game. If users are tagged with an acquisition channel these channels are made available through this filter. This allows all the charts in the dashboard to be filtered by acquisition channel. You can look at either a single acquisition channel or combing multiple acquisition channels. Any annotations that are within the date range selected are available to be displayed. Selecting the annotations displays them on all the charts. The annotations are displayed in different colours depending on the type of annotation selected. A segment that has been defined by the segment tool can be selected and used as a filter on the charts. When a game is created there eight auto generated segments that cover spending and engagement and these are available to all users. Each chart has four icons that provide extra detail. The icon shows the legend for the chart, the icon provides statistic, the icons provides a dedicated help page for the chart giving information on the data being displayed and help in how to use the results. The icon allows the data to be exported in csv and various image formats. It is possible to zoom each chart using the zoom bar at the top of the chart . Once a chart has been zoomed, click on the icon to reset the zoom and show the full date range. This allows extra information to be stored against a game; this can include version releases, acquisition channels, failures, and changes to the event list, offers or promotions. 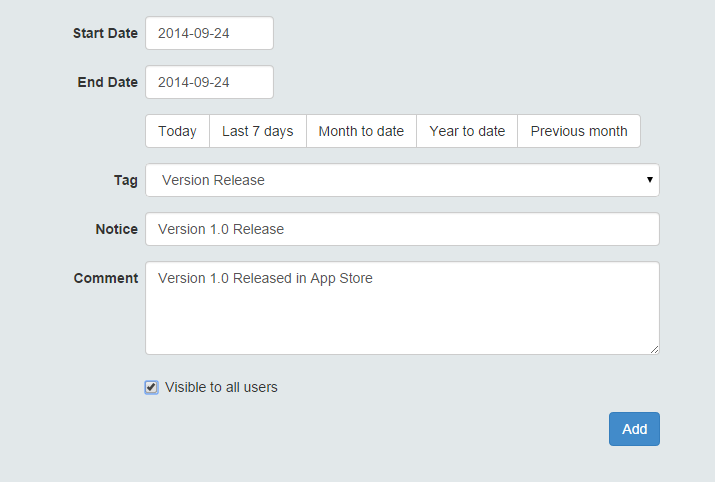 Each annotation can have a single date or date range and the related notice. The notice can be deleted and edited. By selecting the annotations filter, users can switch on and off events and they will be displayed on all the charts. The colour of the annotation is based on the tag type. The Retention Matrix is a very powerful tool. It allows you to understand how the game is retaining players. This table shows how many players have played up to the selected date. Each player’s history is shown in terms of number of days played and how many days have passed since they last logged in. Players can also be filtered by Player Start Date. This can help to monitor retention rates for new players over time. The data can also be filtered using age, gender, location and acquisition channel. This table shows the number of players who pay on a selected date, broken down by Total Revenue and Number of Transactions. Players can be further filtered by Player Start Date. If there are daily spikes in revenue, this table can be useful in determining whether the spike is coming from one-off payers or existing payers. Similarly, if daily promotions are run, we can see whether new or existing payers are responding. The example below shows that 4,970 players have made just one purchase within the filtered date date range. We can also see that 144 players made exactly four purchases and have a total revenue between 60 – 79.99 within the filtered date range. A cohort of users is a subset of users, using the filter tool it is possible to look at users by gender, location, start date etc. 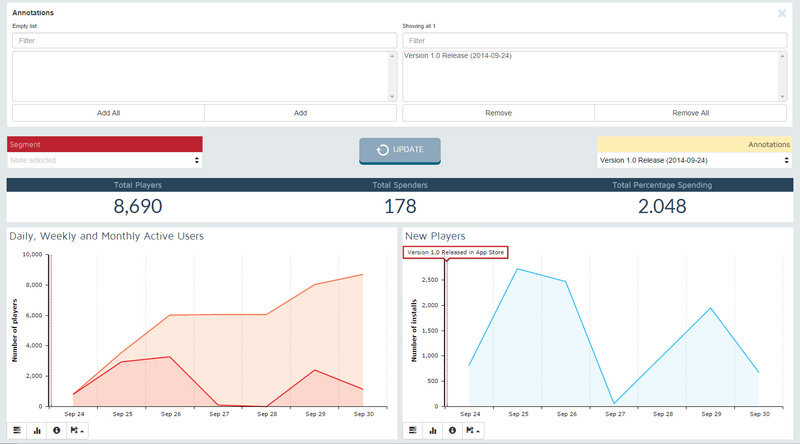 Being able to compare cohorts of users is extremely useful, looking at new users before and after a major change in the game gives a good understanding of how the changes have impacted the user base. The cohort comparison tool provides a simple and intuitive interface to do this. The control panel at the top of the interface allows you to define the two charts that are being displayed for each cohort. All the charts that are available in the main dashboard are available in this tool. By default the tool creates two cohorts, it is possible to add a further 8 cohorts to the interface if required. It is also possible to allow the y axis of the charts to be aligned or for each chart to provide a best fit for the y-axis. For each cohort the standard filter interface is available so a different cohort can be defined and compared across cohorts.